TMC education is for all-from individual, family, friends, and colleagues, to groups and organizations and institutions. 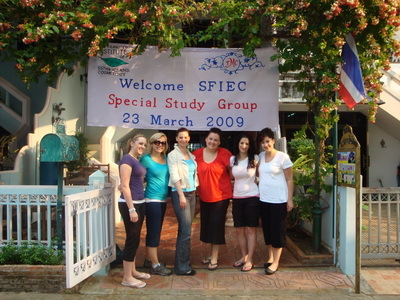 Group Study tour is a practical way of getting a group of students to come to Thailand and study Thai massage. Students feel safe and comfort knowing all will be taken care of. The group organizers choose TMC for the destination of learning Thai massage from good quality education and provide services as promised. Transportation to & from school within city zone; practice clothes; herbal tea and all the textbooks/manuals are provided. 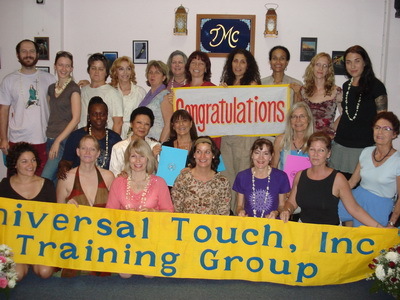 Our company (Universal Touch, Inc. Deerfield Beach, FL. 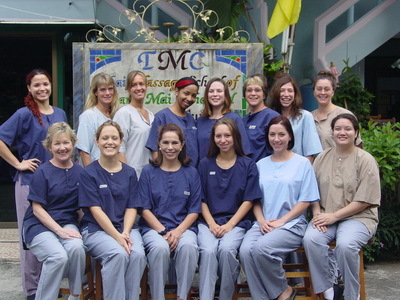 USA ) has been working with TMC School for over 5 years. 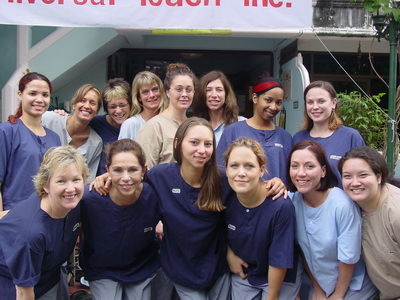 The staff is excellent and go out of their way to help our students not only learn Thai Massage but to make their 3 weeks in Thailand an enjoyable and memorable experience. As the Thailand Trip administrator I am tasked with getting all of our students enrolled at TMC School and again the staff is excellent. They graciously accommodate any special request or need in a timely and very professional manor. I've dealt with many massage schools in the past 10 years, in both the USA and Thailand and TMC School is one of, if not the best." Kardinia High School, Australia 2004 until present: Part of the cultural study of Kardinia High School students in Thailand includes Thai massage. 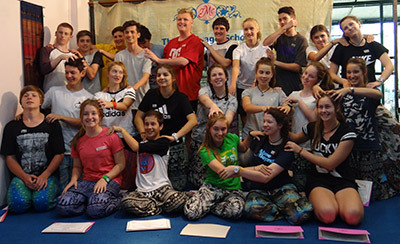 TMC developed basic Thai massage course for the teens to apply with their daily lives such as how to release tension before their PE class and relaxation for their parents at home. Students continue their study in Thai massage and able to make use of what they learned. 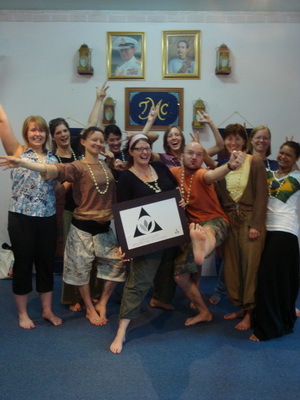 These words of mouth spread to their friends and the teens look forward to attend Thai massage classes at TMC. 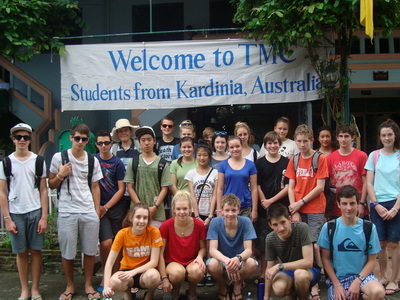 The Kardinia High School students take turn to attend Thai massage class at TMC since 2004 with average 4-5 groups a year. 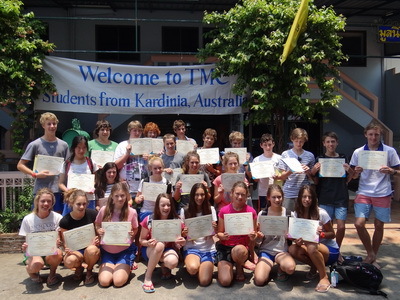 So far, there are over a thousand of Kardinia High School students attended Thai massage classes at TMC school. 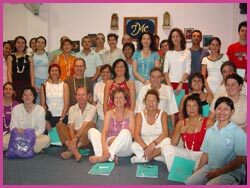 Therapists from Spain 2012: The group of massage therapists from Spain study Foundation of Thai Massage at TMC. 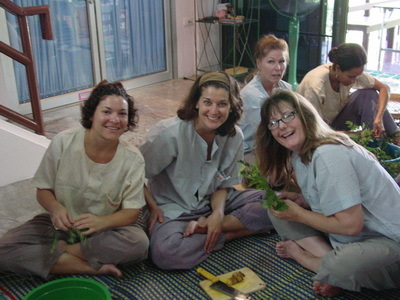 Everyone enjoyed the time and received solid background in Thai massage plus learn Thai culture. Dararasmi Police Hospital, Thai Traditional Medicine - Thai Massage Department, Mae Rim, Chiang Mai 2012: TMC offered continue education to the massage therapists of the hospital on safety massage, cautionary sites, and additional therapeutic techniques. TMC is invited as part of the committee member for massage therapists selection. Senaji Studio, Japan 2012: The firm runs by GCT 600 Hour graduate teacher from TMC. 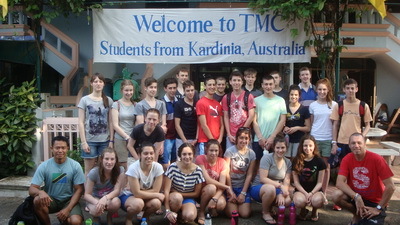 The teacher arranged the study tour from the Japanese students to attend at TMC. Students burden free from trip arrangement and receive the right training at the school. Professors from Department of Physical Therapy, Faculty of Associated Medical Sciences, Chiang Mai University (CMU) 2009: The CMU professor team provided therapeutic treatment for the special children in cooperation with TMC at Physical Therapy Department of CMU. The children were from Lam Pang and Chiang Dao. 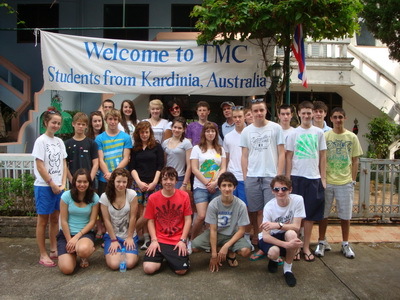 Firbank Grammar School, Australia 2009: Part of the cultural study of the Kardinia High School students in Thailand includes Thai massage. TMC developed the simple course of basic in Thai massage for the teens to apply with their daily lives such as release tension before their PE class and relaxation for their parents at home. 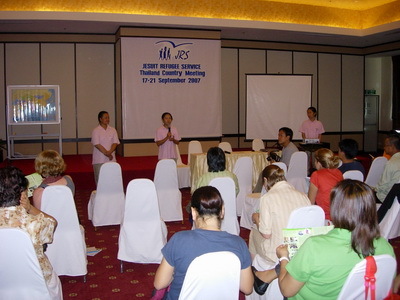 National Health Practitioners of Canada (NHPC) 2009: The first group study tour from NHPC to bring their members to explore Thailand and learn Thai massage to enhance their massage profession. Memorable experience to all and the continuation of the education exchange program between NHPC and TMC school for many more years to come. 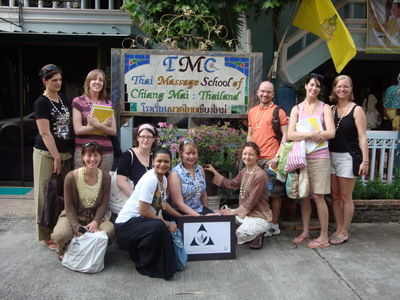 San Francisco Institute of Esthetics and Cosmetics, California, U.S.A. (SFIEC) 2009-2008: The first and second group of therapists in cosmetic organized by SFIEC direction study at TMC to enhance their field with Thai massage knowledge. The therapists enjoyed the uniqueness of Thai massage with the application of mini herbal ball with facial massage and Thai Table Massage which in line with their treatment set up in cosmetic field. 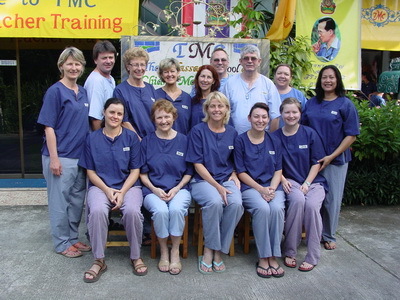 Physical Therapy Students from Australia under the preceptor of the professor from Department of Physical Therapy, Faculty of Associated Medical Sciences, Chiang Mai University (CMU) 2008: TMC host Thai massage training for the exchange physical therapy students from university in Australia by CMU. Students get to understand the basic of Thai massage and will be able to apply with physical therapy. 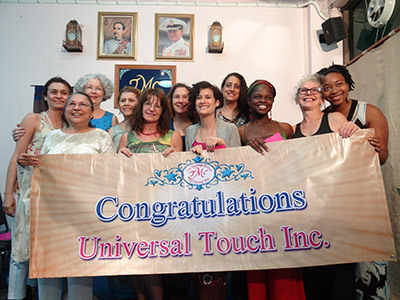 Universal Touch Inc Study Tour Group 2008: The group was led by An award winning teacher of the year through all the career colleges of the United States, President/Head Instructor: Universal Touch Inc. Florida, USA – Margie Meashew who also attended Thai massage classes at TMC. The students were massage therapists who seeking Thai massage as the modality to enhance their massage profession and they have founded here at TMC. UTouch Inc and TMC have created strong-sincere long lasting relationship to expand knowledge of Thai massage to more interested therapists. Universal Touch Inc Study Tour Group 2007: Some of the therapists returned with the following group to study higher levels at TMC while get to enjoy the wonderful high standard group study tour service from UTouch Inc.
Chiang Mai University Graduate Program Seminar in Thai Massage for Health 2007: TMC participated with the postgraduate program in the study subject of Thai Massage for Health and present the Thai massage workshop at the university during the seminar. Chiang Mai University Training Service to the Staff from Jesuit Refugee Service, Thailand Meeting 2007: TMC trained simple Thai massage technique to alleviate back muscle tension to the member of the group at Chiang Mai University. 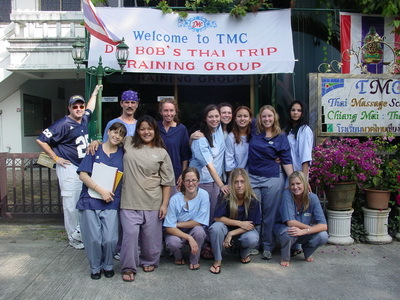 Physical Therapy Students from Australia under the preceptor of the professor from Department of Physical Therapy, Faculty of Associated Medical Science, Chiang Mai University (CMU) 2007-2006: TMC hosted Thai massage training for the exchange physical therapy students from university in Australia by CMU. Students get to understand the basic of Thai massage and will be able to apply with physical therapy. 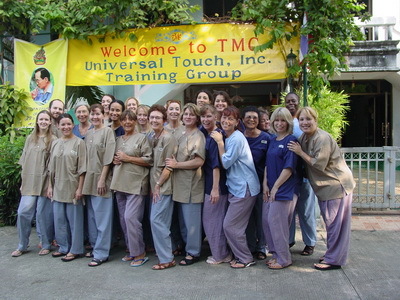 Thai for Health of Body and Mind group training at TMC 2006: TMC hosted the group of Thais in health and wellness program to receive basic Thai massage for improving health at the school. GCT interns were part of the training for the group. 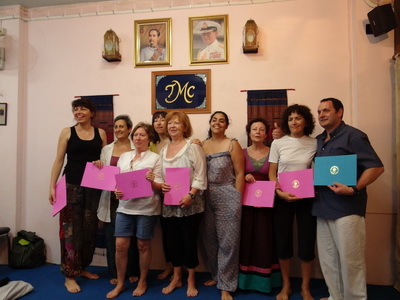 Everyone enjoyed the class and have another modality to enhance their health and well - being. Universal Touch Inc Study Tour Group 2006: The first study tour group by UTouch to TMC and continue ever since. Some of the therapists returned with the following group to study higher levels at TMC while get to enjoy the wonderful high standard group study tour service from UTouch Inc.
Thai Massage Study Tour by Dr. Bob Smith from 2006 to 2007: TMC welcome students from Dr. Bob Smith to study Thai massage while visiting Thailand. 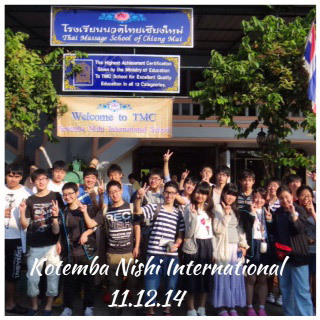 TMC hosted several groups arranged by Dr. Bob in cooperation with TMC school. 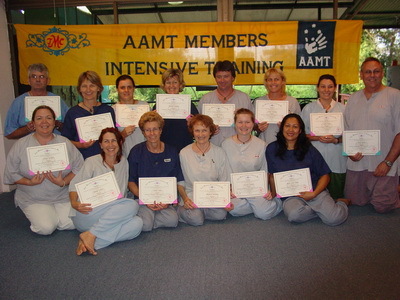 Australia Association of Massage Therapists (AAMT) 2006: The first exchange education study group from AAMT. The CEO and the Director visited TMC school to evaluate the education standard in order to approve the provider for continuing education status per TMC application. TMC school was approved as the pioneer to more CE providers to follow. AAMT invited TMC for exchange education in Australia and in study tour for their therapist members. AAMT and TMC continue with education exchange, official visits and to the long lasting relationship in building high standard of education in massage. 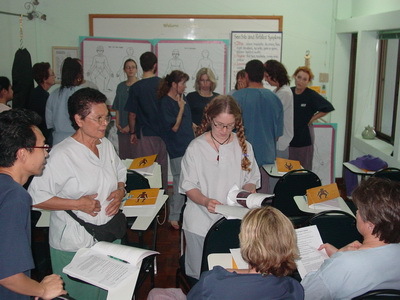 Group Study from Spain 2005: Special 1 day training class for visitors from Spain. 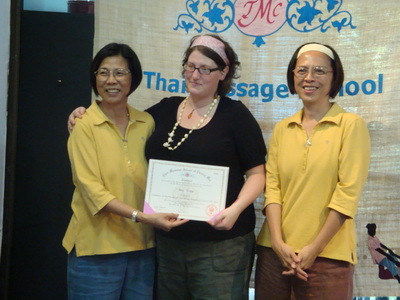 The short course is in basic Thai massage for relaxation. 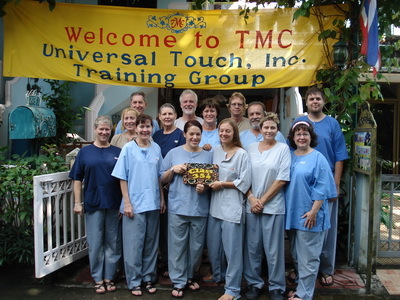 Everyone enjoyed the day at TMC and claimed that they will be able to exchange massage for each other during the trip and for people back home.